Bronze whaler sharks, Carcharhinus brachyurus (Günther, 1870), aka narrowtooth shark, bronze, copper shark and bronzys, reach a maximum of 3.25 m in length and weigh a maximum of 305 kg. 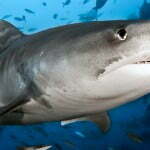 They are large sharks with blunt, broad snouts, narrow bent cusps on the upper teeth, and no interdorsal ridges. They are gray to bronze in color on the dorsal side, white on the ventral side. 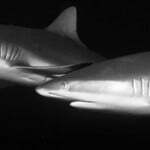 The fins have similar coloring with the exception of the pelvic fins, which have dusky tips, and the pectoral fins, which have dusky to black tips. Bronze whalers are found in subtropical waters between 45°N-52°S in the western Atlantic off the coast of Mexico, in the Gulf of Mexico, and off the coasts of Brazil to Argentina. In the eastern Atlantic these sharks are found off the coast of France south to the coast of southern Africa to central Natal, South Africa. It is thought that 2 separate populations exist in southern Africa. In the western Pacific, bronze whalers are found from Japan to New Zealand, and in the eastern Pacific off the coast of southern California, USA to the Gulf of California in Mexico and Peru. Bronze whalers are found in offshore waters along continental margins. They occasionally enter inshore waters and large coastal bays. This species is migratory in the northern part of its range, traveling north in spring and summer and south in autumn and winter. 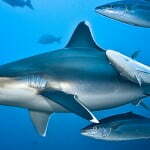 This species feeds on pelagic (open water) and bottom bony fishes, cephalopods, smaller sharks, and rays. Bronze whalers are viviparous, meaning females nourish embryos with a placenta and give birth to live young. This species is slow to reproduce. Check the Conservation Status of Bronze Whaler Sharks Note: if there are no entries found, it only means that this species has not yet been evaluated. Bronze whaler sharks are commercially hunted throughout their range and are a very popular species for sports fishermen. They have been implicated in bites to humans, particularly spearfishermen. The copper shark, bronze whaler, or narrowtooth shark (Carcharhinus brachyurus) is a speciesof requiem shark, family Carcharhinidae, and the only member of its genus found mostly attemperate latitudes. 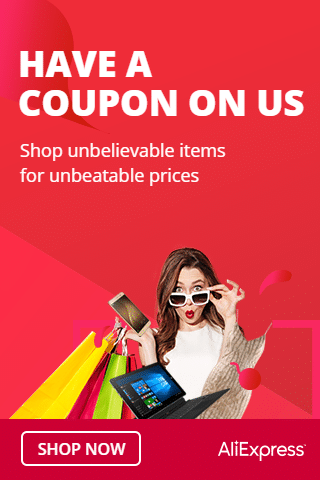 It is distributed in a number of separate populations in the northeastern and southwestern Atlantic, off southern Africa, in the northwestern and eastern Pacific, and aroundAustralia and New Zealand, with scattered reports from equatorial regions. This species can be found from brackish rivers and estuaries, to shallow bays and harbors, to offshore waters 100 m (330 ft) deep or more. Females are found apart from males for most of the year, and conduct seasonal migrations. 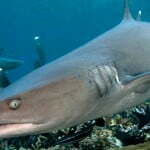 A large species reaching 3.3 m (11 ft) long, the copper shark is difficult to distinguish from other large requiem sharks. It is characterized by its narrow, hook-shaped upper teeth, lack of a prominent ridge between the dorsal fins, and plain bronze coloration. Feeding mainly on cephalopods, bony fishes, and other cartilaginous fishes, the copper shark is a fast-swimming predator that often hunts in large groups, utilizing their numbers to their advantage. Off South Africa, this species associates closely with the annual sardine run, involving millions ofsouthern African pilchard (Sardinops sagax). Like other requiem sharks, it is viviparous, with the developing embryos mainly nourished through a placental connection formed from the depleted yolk sac. Females bear litters of 7 to 24 pups every other year in coastal nursery areas, after a gestation period of 12 or perhaps as long as 21 months. It is extremely slow-growing, with males and females not reaching maturity until 13–19 and 19–20 years of age respectively. 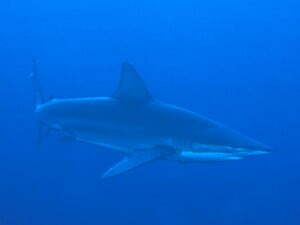 While not noted as being especially dangerous to humans, the copper shark has been responsible for a number of non-fatal attacks, particularly on spear fishers and bathers. This species is valued bycommercial and recreational fisheries throughout its range, and utilized as food. It is very susceptible to population depletion due to its low growth and reproductive rates, and its numbers are believed to have declined in some areas. As a result, the International Union for Conservation of Nature (IUCN) has assessed it as Near Threatened.